This article shows how Stalin killed millions of people who were a threat to him politically and how Stalin double-crossed people who he worked with at first. I chose this source as it clearly stated how terrified many people were due to Stalin's actions, as they could be the next ones to be killed. The article also stated that the survival rate was only 3%, only 3% of the total population did not have to fear being killed or taken away, suggesting that majority of the people were terrified. Stalin killing millions of people and causing 97% of the population of be terrified was clearly not beneficial for the USSR. The image above shows that Stalin had taken a photo with a comrade and edited him out afterward to emphasise and glorify Stalin's presence. I have chosen this source as it is proof that photographs were edited to remove others in order to emphasise Stalin's presence. His actions of editing people out of photographs so as to emphasise his presence is not beneficial for the USSR. This short video shows us a teacher taking young children around a school on the first day of school. In the school, there are many classrooms teaching many students of different ages many things. I chose this source as suggests that education was compulsory as there were many people of different ages in the school, showing how much Stalin focuses on school. Stalin focusing on school is beneficial to the USSR as school teachers children and helps them to learn new knowledge and be literate. 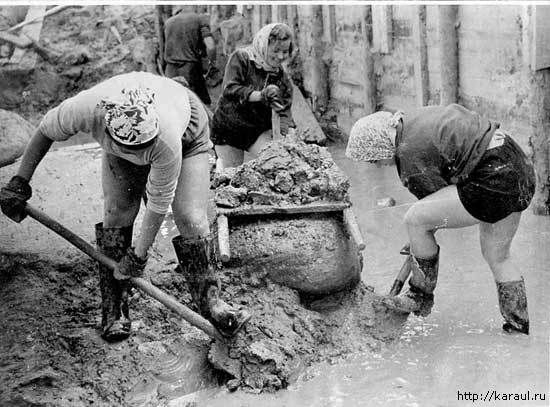 The picture shows women digging the ground, working hard during Stalin's rule, suggesting that women were given more rights and equality, as compared to men. I chose this source as it tells us that during Stalin's rule, women were allowed to work and were given more rights, hinting that there was more equality between men and women socially. Stalin allowing women to work was beneficial for the USSR as there were many more workers now and the risk of having a shortage of workers decreased. This political cartoon illustrated an rather old-aged man sitting on a chair, below a portrait of Joseph Stalin, panicking upon seeing soldiers kill many people. The man sitting below the photo of Stalin shows that Stalin is very respected among the citizens, it also suggests that the people were killed for not respecting Stalin. Stalin killing people who do not respect him is a method of instilling fear and obedience into citizens. I chose this source as it shows us that Stalin eliminated many people, no matter how important they were to him. The frightened old-aged man in the cartoon also suggests that Stalin targeted older figures as by eliminating older people, he can promote the younger men who were loyal to him. Promoting them made them completely loyal to Stalin. Stalin killing many people was definitely not beneficial for the USSR. Thank you, dear Stalin, for our happy childhood! The images portrays Stalin as a powerful man who cares for all his people. With children looking up at him with happy smiles and Stalin looking down at them warmly, the image depicts Stalin as a fatherly figure towards USSR. I have chosen this source as it shows that during Stalin's rule, politcal images of Stalin that were designed to make him look a great leader were everywhere, evoking a sense of loyalty pledged towards him amongst the youth. His goal of wanting to secure loyalty towards him in his people is not beneficial for the USSR.